Chipper Jones' consistency at the plate led him to become the best position player for the Braves since the franchise moved to Atlanta. The impressive amount of playoff appearances for the team can be attributed to his bat nearly as much as the Braves' remarkable pitching. 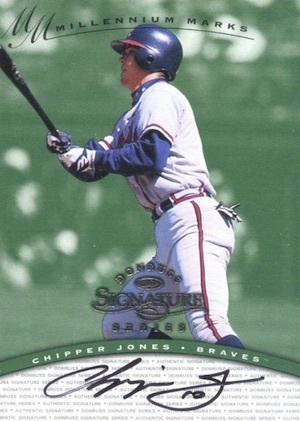 This list of the best Chipper Jones baseball cards includes minor league appearances, major league rookie cards, and certified autographs from his Hall of Fame career. Born Larry Wayne Jones Jr., he got his famous nickname of "Chipper" by reminding his family of his father and being a "chip off the old block," as the expression goes. A top high school player out of Florida, Jones was selected as the first-overall pick in the 1990 amateur draft. Shop for Professionally Graded Chipper Jones cards on eBay. 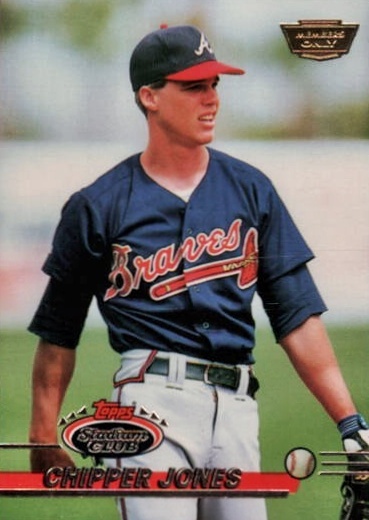 Pre-dating his MLB career, Chipper appeared in the flagship baseball set two years before he would debut in the majors and four years before he would become a full-time starter, making it somewhat confusing for fans as to which would be considered his proper rookie cards. Collectors have certainly put a premium on his initial draft cards from 1991 and you'll find several of those cards covered below. In addition to the signed cards highlighted, a notable Chipper Jones autograph can be found in the 1998 Donruss Back To The Future dual autograph insert that combines a star player and an up-and-coming stud. Jones, the young phenom in this instance, was partnered with Braves Hall of Famer Eddie Mathews. In 2016 Topps Archives, an on-card autograph for Jones is done in the style of the 1985 Topps #1 Draft Pick cards. In the same set is a new Chipper card using the 1991 Topps design that also offers a Desert Shield stamp as a short-printed variation, just like his famous rookie card. 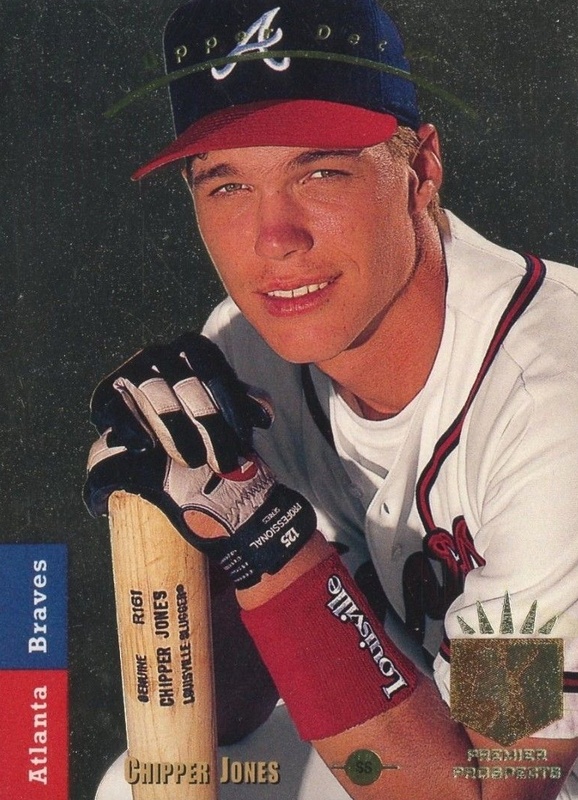 Chipper Jones arrived in professional baseball right at the peak of the overproduction era, making many of his pre-rookie and rookie cards very available to collectors on any budget. In placing the cards on this list, card value and popularity with collectors were the main factors. The 1991 Bowman set expanded from 528 cards to 704 and Bowman used those extra spots to sculpt one of the strongest checklists of the early 1990s. Full of key rookie cards, the set is similar to the 1953 Bowman design as it relies on close-up photographs instead of action shots. Jones appears as the #1 draft pick from the previous year's draft. 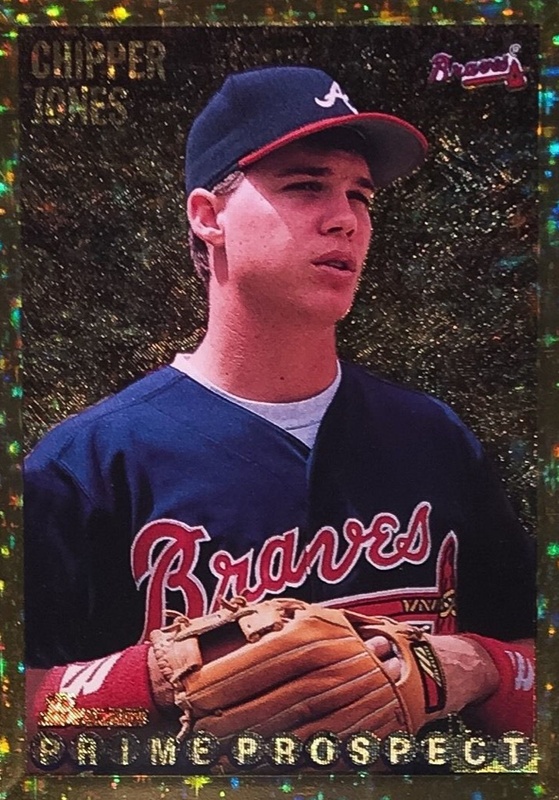 While it would be two more years before he would play his first major league game for the Atlanta Braves, that didn't stop the card from becoming the most valuable in the set. 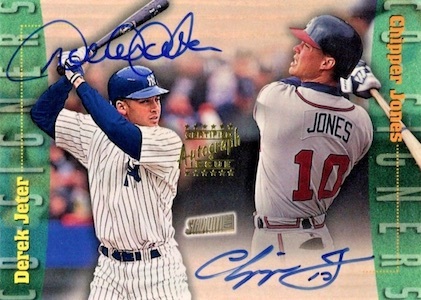 A notable Chipper Jones option is the Co-Signers dual autograph card he shares with New York Yankees legend Derek Jeter in 1999 Topps Stadium Club. Co-Signers autographs could be pulled 1:254 packs of Stadium Club, on average. You can also find Jones in other combination autographs with Alex Rodriguez, Scott Rolen, and a quadruple autograph card featuring all four players. These are all tough to track down. The 1992 Topps Stadium Club set was divided into three series and inserted into the third series were three cards devoted to the top draft picks in the 1990, 1991, and 1992 amateur drafts. Jones is featured as card #1, followed by prospects Brien Taylor and Phil Nevin. The cards differ slightly from the standard '92 Stadium Club design as they feature foil stamping down the right side and a "#1 Draft Pick of the 90's" notation at the bottom. 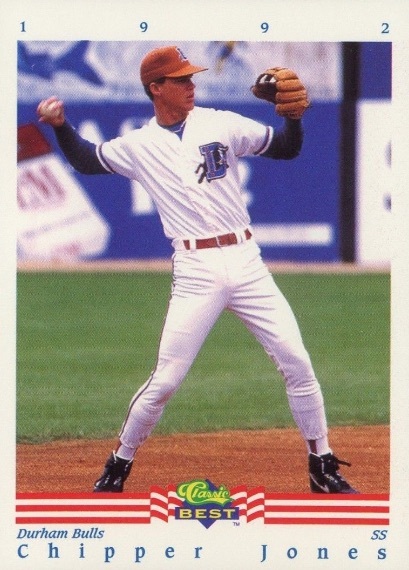 While most Chipper Jones rookie cards show him in a posed photograph, his 1991 Upper Deck Top Prospects card features him preparing to field a grounder. Jones was still a shortstop at this point in his career but his fair-to-average fielding skills eventually pushed him around the horn to third base. His offensive production there was nearly unmatched by any other third baseman, and his career total of 1,623 RBI places him two hundred above first-ballot Hall of Famer Mike Schmidt. A key highlight of 1995 Bowman is the silver-etched foil cards for the Prime Prospects, Minor League MVPs, and 1st Impressions subsets. These cards averaged one in every pack and collectors can find Chipper's card in Prime Prospects. For those fans eager for a chase, the most sought-after cards from the product are the gold foil editions, which are pulled at a rate of 1:6 packs in '95 Bowman. 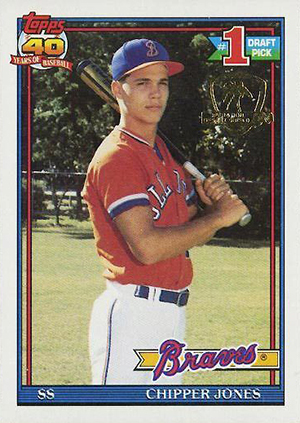 The mixed-up nature of Chipper's early hobby career helped the push to create standard rules governing when companies could issue a player's official rookie card. 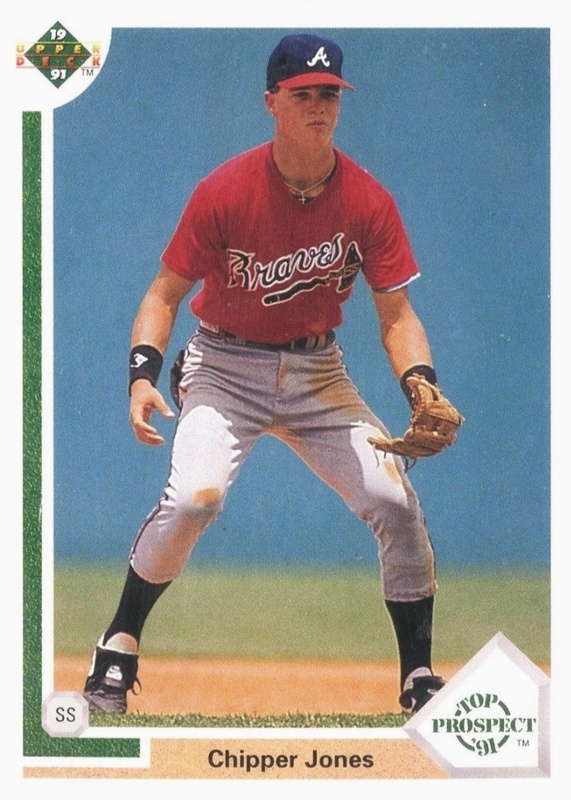 In Chipper's case, he had cards in every major card brand before he even became a star in the minor leagues. 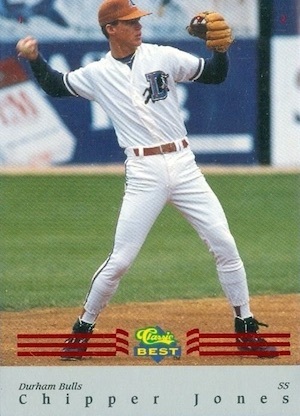 For example, his minor league card in 1992 Classic Best comes a year after his Topps rookie in 1991 Topps. 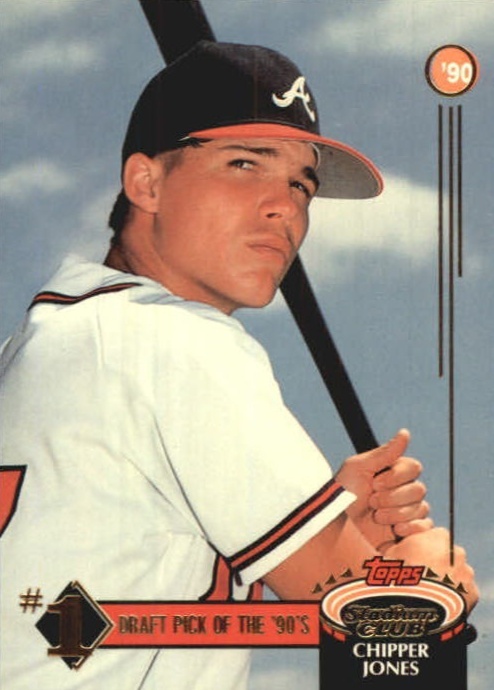 Today, players have to be named to a 25-man roster before their rookie card can be released, meaning Chipper Jones rookie cards would have been issued in 1993 under these rules. 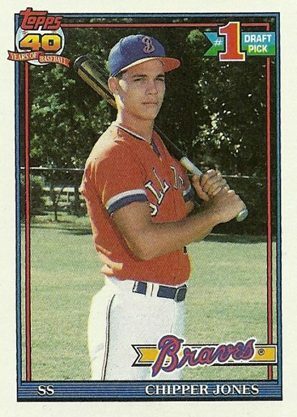 After playing with the Macon Braves, Chipper was moved to the Braves' Single A-Advanced team, the Durham Bulls. Inserted into packs of 1992 Classic Best are Blue Bonus and Red Bonus cards (shown second). These cards were similar to the base card but have the white border removed and feature either blue or red foil stamping on a redesigned lower half of the card. Members of the "Topps Stadium Club" had the opportunity to purchase an exclusive 750-card set of 1993 Stadium Club that features "Members Only" foil stamping in the upper-right corner of each card. The cards themselves were identical to the regular base cards except for the foil stamping. Production is estimated to be around 12,000 individual sets, making Members Only one of the most limited releases of the era. 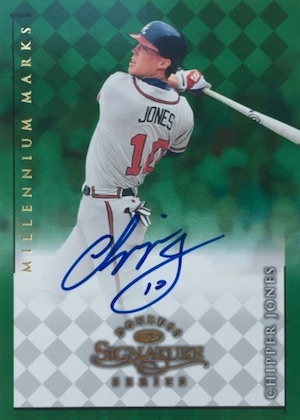 Collectors can find Chipper Jones autographs in both the Millennium Marks and Century Marks parallels in 1997 Donruss Signature. The Millennium Marks autographs have a green background and Century Marks have a blue backdrop. As the name suggests, Millennium autographs are generally numbered to 1,000 copies and Century Marks are limited to 100. However, it is believed that Jones signed just 900 of the Millennium cards. Amazingly, original packs from this product were only $15 and featured an autograph in every pack. He also signed for the 1998 set, which is shown second. Upper Deck dipped their toe into the super-premium card world with 1993 SP and the set remains very popular to this day. Jones is featured in the Premier Prospects subset that includes the famous Derek Jeter rookie card. 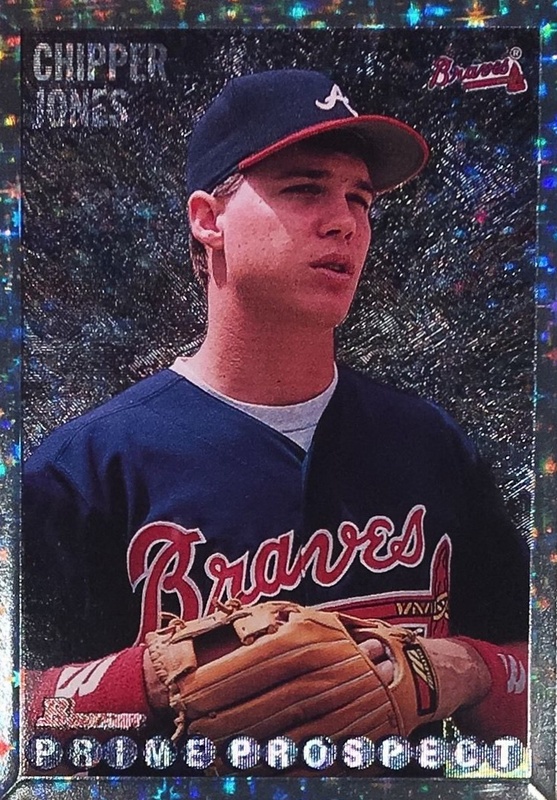 Although Chipper's appearance in the set isn't technically considered a rookie card, it is one of his most popular cards on the secondary market. Due to the fragile nature of the beautiful foil design that is easily damaged or chipped, high-grade copies of his card can top $500 at auction. Collectors have two main options in picking up the top Chipper Jones rookie cards out there with his 1991 Topps release. The gold stamped Operation Desert Shield version (featured first) is limited to about 6,800 copies through sets that were made available to service men and women serving in Iraq and Kuwait. 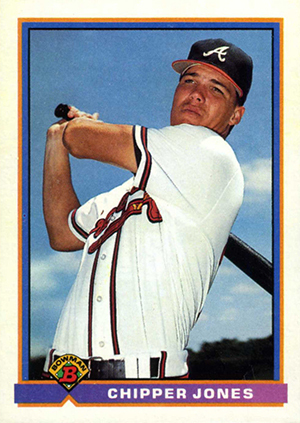 The glossy Tiffany version of his rookie card, shown second, was limited to several thousand copies, although a specific 1991 Topps Tiffany print run is unknown. No Tiffany cards were included with the Desert Shield cards, so fans looking for a high-end Chipper rookie can't go wrong with either option. Chipper Jones Atlanta Braves Headliners XL figurine Limited Edition! CHIPPER JONES 1991 SCORE BASEBALL ROOKIE CARD #671 BRAVES SHARP! I recently inherited a very large collection of Chipper Jones cards, etc. My uncle was a big fan. Do you know any forums or individuals that might be possibly interested in buying the collection? 2004 ULTIMATE CHIPPER JONES GOLD AUTO JERSEY 50 AUTOGRAPH BRAVES LEGEND HOF ?